2 weeks I was invited to witness the launch of latest L'Oreal Professionnel Wild Stylers and Techni.ART in KLCC Fashion Week 2014. Bernie Chan was the emcee for that day! To further endorse this collaboration, L’Oréal Professionnel introduces a brand new look for Tecni.ART as well as launches new styling ranges that offer even more trend possibilities. Aligning itself with Hollywood, Tecni.ART sports a chic graphic design reflecting its new identity. The design – inspired by the world of the salon meeting the world of fashion’s backstage – showcases a premium feel with its pearly white finish, silver mirror detail, and just a touch of colour as indication of the products’ hold levels and functions. The latest L’Oréal Professionnel Wild Stylers is what you need to achieve the It Look in Hollywood – grunge-inspired and messy locks without hair feeling rough to touch. Achieve this dishevelled look that’s popular everywhere, from the red carpets to fashion runways. For the first time, get that wild-mane effect but still maintain hair’s softness with Wild Stylers. Unleash your inner feline with out-there volume and audacious texture with Wild Stylers Crépage de Chignon (RM 55), the first mineral fixing spray that texturises hair with no rough touch. Its natural mineral salt origin helps to create a lift for wilder and oversized texture. Or restyle without limits with Wild Stylers Depolish (RM 55), the first creamy paste for an unpolished matte look with a hold that’s re-adjustable. Its texturising polymers deconstruct hair for easy styling while its fatty ester and silicones allow for softness and flexibility so that you can play up your hair, whenever you want. And this L'oreal Professionnel Tecni.Art Air Fix (RM45) is my personal favourite hairspray! It holds my hair really well and felt light too! Just before the launch started I had the privilege to go backstage all thanks to Centro Hair Salon to see the craze before the show! Tons of accessories lies down nicely on the table.. Spotted Kevin Woo, the Creative Director/Founder of Centro busy touching up the model's hair using L'oreal Professionnel Elnett Hairspray! This L'oreal Professionnel Elnett Hairspray will holds hair for hours, brushes out in seconds. It has Level 4/6 strong holding factor. Super gorgeous model with her glamorous yet sophisticated tousled hair look! Her bun is so neat and nice, and I have checked and this is all her real hair...! 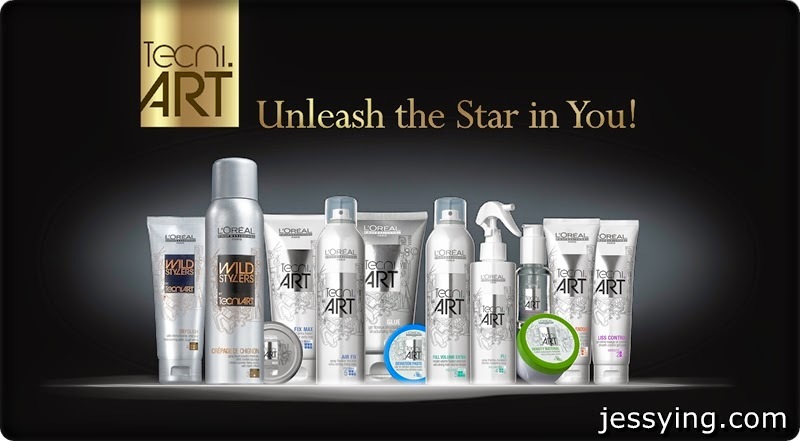 All these amazing hairdo you see in the pictures used the new Tecni.ART & Wild Stylers products which would be available at all L’Oréal Professionnel salons starting from April 2014.